Negative selection removes thymocytes that are capable of strongly binding with "self" MHC peptides. Thymocytes that survive positive selection migrate towards the boundary of the cortex and medulla in the thymus. While in the medulla, they are again presented with a self-antigen presented on the MHC complex of medullary thymic epithelial cells (mTECs). mTECs must be AIRE+ to properly express self-antigens from all tissues of the body on their MHC class I peptides. Some mTECs are phagocytosed by thymic dendritic cells; this allows for presentation of self-antigens on MHC class II molecules (positively selected CD4+ cells must interact with MHC class II molecules, thus APCs, which possess MHC class II, must be present for CD4+ T-cell negative selection). 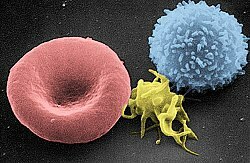 Thymocytes that interact too strongly with the self-antigen receive an apoptotic signal that leads to cell death. However, some of these cells are selected to become Treg cells. 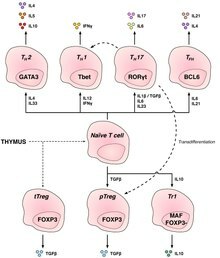 The remaining cells exit the thymus as mature naïve T cells (also known as recent thymic emigrants ). 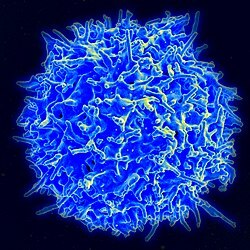 This process is an important component of central tolerance and serves to prevent the formation of self-reactive T cells that are capable of inducing autoimmune diseases in the host.